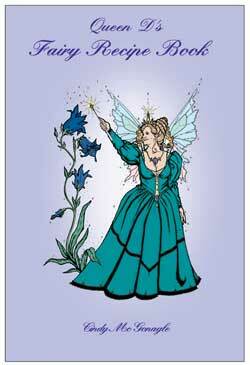 Queen D's Fairy Recipe Book by Cindy McGonagle. Queen D is a Fairy Queen and a very close friend of mine. I met her during a meditation in which I was requesting a Fairy to be my friend. I heard a name. She explained, “Queen D” is the name I prefer to be called. Our friendship has blossomed over several years. I hope you will have as much fun trying these Fairy recipes as we had in writing this book. Many Fairies and Beings of Light have contributed their recipes for your delight. Having shared many a cup of tea with my friends and family, I do hope you will do the same with your very best friends too. The growing, gathering and mixing of the flowers, herbs and roots are all part of the fun. Work with the knowledge shared by a Fairy Queen to mix teas, perfumes, bath combinations and much more. Understand the mysteries of Fairy legends and sacred ceremonies. Flower Devas and Angels combine their talents to create Heavenly Notes for you to wear. To order call 503 531 2758, please note we no longer ship outside the continental United States of America.